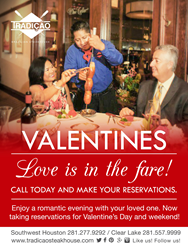 Tradicao Brazilian Steakhouse provides local residents a romantic meal for the perfect Valentines with their loved one in Southwest Houston and Clear Lake. Houston residents will be able to celebrate Valentines meals with loved ones at Tradicao Brazilian Steakhouse from Feb. 12-14. The restaurant will be serving a romantic traditional Brazilian style lunch and dinner. "Valentines is the most romantic time of the year and a reminder to show your appreciation to your loved one." Daison Cima, Tradicao manager said. "We want to provide the opportunity for long time and recent couples to be together and enjoy our delicious meal. Our restaurant is perfect for couples who want different meats. We serve 15 selections of beef, lamb, chicken pork and seafood. One can have filet, the other lamb chops or even both!" Tradicao Brazilian Steakhouse offers diners a full all-you-can-eat Brazilian dining experience. From the traditional Picanha top sirloin steak and Filet Mignon served tableside to delicious shrimp and fresh salmon - Tradicao Brazilian Steakhouse has all of the best Brazilian steak and seafood offerings. They have two locations to choose from – Southwest Houston/Fort Bend at 12000 SW Freeway or in Clear Lake/Webster at 201 W. Bay Area Blvd. To contact the SW Freeway location call 281-277-9292. To reach the Bay Area Blvd. location, please call 281-557-9999.